Welcome to Reading With Rover! Reading with Rover is a therapy dog program serving the community of the Puget Sound. Reading With Rover started out as a community-based literacy program volunteering in the schools, bookstores and libraries of Puget Sound area of Washington State. We now offer the comfort of our therapy dogs at local hospitals, assisting living homes, rehabilitation facilities and we are very popular college stress relievers! Our programs are a part of several school districts in the area as well. 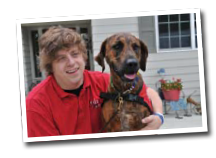 Anywhere there is a need for pet therapy teams, our D.R.E.A.M teams are willing to help. Our teams have hours of training and experience and our program is uniquely different then most. We offer continuing education courses to our teams and our hospital teams have medical pet therapy training as well. We also donate to our communities that we serve. We have provided over 10,000 book bags and new books to children in the Seattle area. We we also have provided funding and partnered with other children charities as well to help them grow their community.